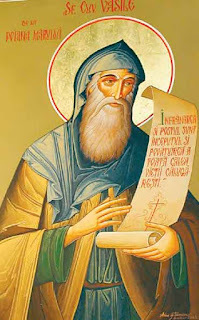 St. Hieromonk Basil was the spiritual father of St. Paisius the starets from Neamţ and one of the most famous teachers and followers of the prayer of Jesus in the 18th century. He is known also for the fact that he was one of those who revived the Orthodox monastic life in his time. Basil was born near Poltava (Ukraine) in 1692 and is a representative of the Russian-Ukrainian monastic migration that occurred in the 18-19th centuries because of the reforms of Peter the Great in Russia and the persecution of the Orthodox believers in Ukraine which was under Polish rule. He lived as youth in different hermitages in Russia, in Moshenski Mountains near Kiev. He came in Wallachia together with his disciple, the monk Michael, and other monks in 1706, during the Reign of St. Constantine Brâncoveanu (…), in a period of religious and cultural flourishing. He settled in Dălhăuţi Hermitage near Focsani, where he lived as a hermit about 20 years. Here he deepened the biblical text and read many writings of the Fathers. Through prayer and theological knowledge he became shortly a good spiritual advisor of the brothers who lived together with him. Basil was ordained priest in 1715 and was appointed abbot of the monastery Dălhăuţi and quickly he was famous throughout Wallachia, even to the new ruler, Constantine Mavrocordat. St. Basil was about 20 years the abbot in Dălhăuţi, where he gathered around him a community of 40 hermit monks. During this time there is supposed that he became aware of the hesychastic tradition initiated by St. Pachomius the Bishop of Roman (+ 1726) at the Pocrov Scete, and Basil implemented it among his disciples. Hesychasm is an Eastern spiritual movement. The hesychia is a Greek word meaning “peace” or “silence” and refers to a tradition of hermit prayer, whose practice is called hesychazo, “keeping the silence.” The movement, known also as the Palamism, was developed at Mount Athos, while St. Gregory Palamas, Archbishop of Thessalonica (1347-1359). According to this doctrine, the Christian layman or monk must live in peace and silence, reconciling his body with his soul, remaining in a state of contemplation. The central practice is the so-called permanent prayer of the heart or mind ("Lord Jesus Christ, Son of God, have mercy on me a sinner"), a formula designed to keep awake the conscience of God’s goodness and of the sinful status of the creature. This tradition is supposed to be first formulated by Gregory Palamas, but there is evidence that the origins of the practice of prayer are much earlier by the hermits of Egypt in the first Christian centuries. The community of Basil valued the virtues of obedience, humility, silence and especially the practice of Jesus’ prayer. The internal rule stated by the abbot consisted into the living in perfect harmony, daily reading of Scripture and the Fathers, practicing Jesus’ prayer, keeping the mind pure, only one meal daily and the weekly communion. 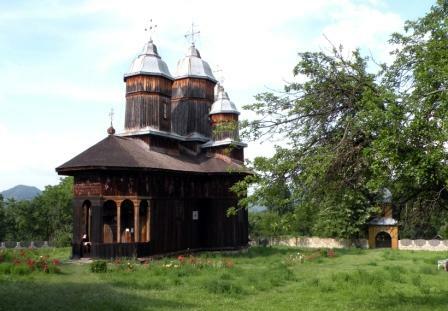 The monastery at Dălhăuţi became a school of spiritual hesychast experience famous in all the Romanian principates. The disciples came from Wallachia, Moldova, Transylvania and Russians, living in perfect love and good order. From Dălhăuţi the community spread to the hermitages around: Trestieni, Ciolanu, Carnu, Ratesti, Rogoz, Bonţăşti, and Black Valley. About in 1730-1733, St. Basil moved to the hermitage of Poiana Mărului (Apple’s Glade) together with 12 disciples, and from here he led spiritually all the hermitages from Buzău Mountains, which he visited regularly. One of his disciples was the St. Paisius of Neamţ, which stayed at Hermitage of Trestieni for several years. From here he went later to Mount Athos in 1750 and after his returning, he established the community at Neamţ, which became the focus of the East Hesychast communities in the 18th century. Being very old, St. Basil gave his soul to the Lord on April 25, 1767, leaving many disciples. He was buried in the yard of Poiana Mărului hermitage, probably somewhere near the Church dedicated to the “Sunday of All Saints”, founded in 1730 by him. So far his holy relics were not found. - Imagine of how we, the passionate and the command-breakers, should repent and learn to work the mental through living in obedience. The quotations below reflect the teaching of the saint. About reading the Scripture: “take care on reading the Scriptures, and if you aren’t human, you will make from yourself a human, because reading the Scripture is a healing well and saving craft. However, it is very important not to understand wrongly the Scripture and misunderstanding the Scriptures is like a deep chasm. Therefore we need to know the writings of the Fathers and other ascetics who help us to the way of salvation”. About the monastic life: St. Basil of Poiana Mărului said to disciples that the monasticism has three ways: the community life, the living in small groups of two or three, called “the middle” or “royal”, having all together, and the third is the wilderness, which is the highest, done only by the holy and perfect ones, after they went through the first two ways. “But some monks choose another way, in outer any obedience and blessing. They make their cell wherever they want and live alone, caring more for the body”. About the high asceticism he said that: “a too early asceticism is cause for pride and self-love, while living with others discover your weaknesses and protects you from temptation. It can clean you daily by the grace of Christ, working out of love for the Lord”. The holy life of St. Basil was well known in his time and until today. That is why the Holy Synod of the Romanian Orthodox Church, on its meeting on 4-5 March 2003, decided that the Abbot of Poiana Mărului shall be venerated together with the venerable and God-bearing Fathers, having his special feast day on April 25, when he went to the Lord. Club roial îi era plebea. Scotea sânge viu din cărţi. Urare de la mulţi ani! Confuzie - fiu de patron? Slujba Deniei Prohodului, numită Denia Sâmbetei celei Mari, are loc Vineri seara. În timpul ei se cântă Prohodul Domnului, o cântare în trei "stări", în care se evocă tristeţea momentului Punerii în Mormânt a Domnului, dar se vorbeşte de nădejdea Învierii celei aşteptate. Slujba Vecerniei Sâmbetei Mari, numită şi "a scoaterii Sfântului Epitaf" are loc în Vinerea Mare. Simbolizează punerea în Mormânt a Domnului. Denia Sfintei şi Marii Vineri se desfăşoară la biserici joi seara. Motivul pentru care se întâmplă o asemenea "mutare" este aceea că timpul nu mai aşteaptă în această Săptămână Mare. Totul se află în aşteptarea Învierii Domnului. Slujba Deniei conţine citirea a 12 texte din cele patru Evanghelii, acoperind informaţiile Scripturistice pe care le avem despre timpul în care Mântuitorul a stat în Ierusalim, a participat la marea Cină a Paştilor evreieşti, numită la noi "cina cea de Taină", rugăciunea din Ghetsimani, prinderea Domnului, judecata Sa şi până la Răstignirea Sa pe Cruce. St. Sabbas the Goth suffered the martyrdom for Christ in the east Carpathian Dacia, being drowned in Buzău river on 12 April 372, from the order of Atharid, a leader of the non-christianized Goths. Information about his life and passion on theactual homeland of the Romanians were kept in his act of martyrdom, composed as a letter of the Gothic Church from north-Danubian Dacia to the church in Cappadocia, as an answer to the request of St. Basil (379) made to Iunius Soranus, the “most brilliant governor (dux) of Scythia Minor”, a relative of Basil who was a Christian, for sending these relics in Caesarea. The relics of St. Sabbas the Goth were accompanied by the text of his holy martyrdom, probably composed in Greek by St. Bretanion, the bishop of Tomis. This letter is also a document about the spread of the Christianity in the Carpathian Dacia among the Dacians, Romans and Goths, in the second half of the fourth century, bearing the long title: “The Church of God who lives in Gothia to the Church of God from Cappadocia and to all the communities of the Holy Universal Church”. St. Basil the Great also thanks in two letters to his fellow friend, Archbishop of Thessalonica Ascholius because he took care of sending the relics of St. Sabbas the GothtoCaesarea (Epistolae no. 164 and 165 in Migne, PG vol 32, cols. 633-641). The Martyrical Acts of St. Sabbas the Goth are important to confirm the existence of the Christianity northern from Danube since the fourth century. This speaks not only about the existence of sporadic Christian missionaries, but also about an organized Church in villages and cities, with bishops, priests and simple believers, who led its life in connection with the Churches in the Roman provinces from the southern Danubian Region and the Church in Asia Minor. Already child, he used to sing psalms in the village church, where served as priest Sansalas. Sabbas was a peaceful and modest young man living in virginity and loving the prayer. At one point the Goths have started a persecution against the Christians, forcing them to eat from the meats offered to the idols. Some non-Christians wanted to escape their Christian relatives from death and gave them to eat publically un-sacrificed meat, thus tricking the persecutors. St. Sabbas opposed this action, and because of that his fellow villagers chased him from the village. After a while he came back. During the second persecution, some villagers wanted to swear that there’s no Christian in their village. But St. Sabbas opposed, saying: “For me swear no one, because I am Christian”. Then he stood voluntarily in front of the persecutor, who saw him and his poor clothes, and because of that he said: “Such a man can neither be useful nor hurt”. During this persecution, Sansalas the priest fled from Gothia in Romania, (that was at that time the name of the Roman Empire). Later ith has been started a third persecution, in 372. 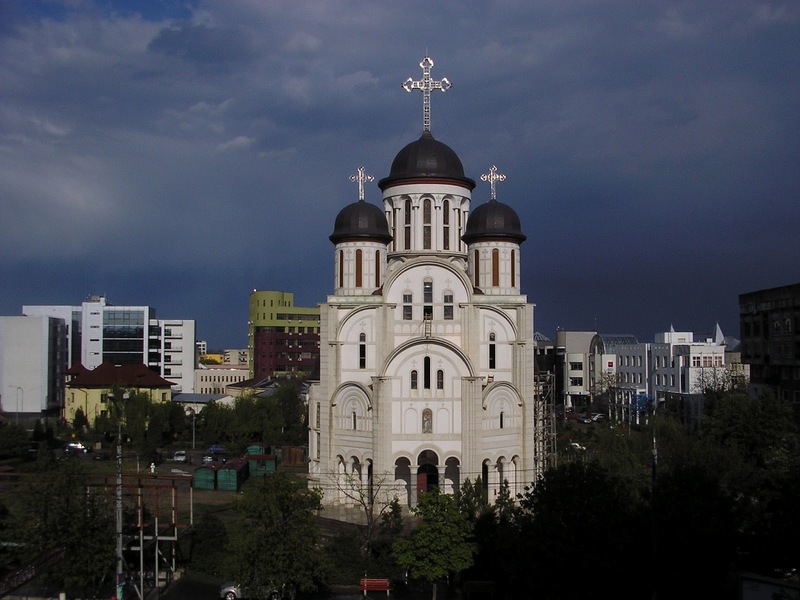 St. Sabbas wanted at that time to celebrate the Easter into the city, together with the Gothian priest Guththicas. But on the way Sabbas had a vision and saw a tall and light-faced man, who ordered him to return to Sansalas, who in the meantime returned to celebrate the Easter together with his community. Thus St. Sabbas turned back and found Sansalas in the village, so they celebrated Easter together. But the third night after the Easter, it came in their village Atharid, the son of a local governor called Rothesteu, with a band of robbers and arrested them. Sansalas was put in a cart, but St. Sabbas, naked, was carried by feet through the recently burned valleys, being strongly whipped. The next day the persecuted laid him on the ground and bound his hands on an axle, and his legs on another one. They beat him and nearly all night. After the servants went to sleep, a host-woman who had woke up to prepare food for the “guests” untied him, but he, instead to escape, helped the woman with her work. Finding out what happened, Atharid commanded to hang the saint of a beam of the house, which shows that people here were certainly Dacians or Romans, because the Goths were living in tents. After this, the servants of Atharid brought food from the gods’ sacrifices and forced Sabbas and Sansalas to eat from these, but they refused. Atharid full of anger ordered the execution of Saint Sabbas. Letting Sansala bound Sthere, the servants took Sabbas to the Mousaios river (today Buzău) in order to drown him there. At one point, the wanted to release him, but St. Sabbas told: “Why do not accomplish what you were commanded to do? Here are those who came to receive me, in front of us, standing in glory” (the angels). Then they immersed him in water, put a timber over his neck and pushed him into deeper. St. Sabbas died as a martyr being 38 years old, in the Saturday after Easter, the day before the Ides of April, i.e. on April 12, 372, during the reign of the emperors Valentinianus (372-392, in the West) and Valens ( 364-378, in the East). His unharmed body was taken and buried by the faithful Christians. Then, after the persistence of Iunius Soranus, governor of Scythia Minor, (the actual region of Dobrogea, situated between Danube and Black sea), the holy relics were taken and sent to Cappadocia, and were deposited in a church in Caesarea, where St. Basil the Great (+ 379) was bishop. The Martyrdom of Saint Sabbas tells nothing about what happened further with Sansalas the priest. Basil asked for his relics in 374, just 12 years after his death, which shows the saint’s high worship, which spread very quickly. The Synaxarion of the Church from Constantinople mentions the martyrdom of St. Sabbas the Goth on 17 April. 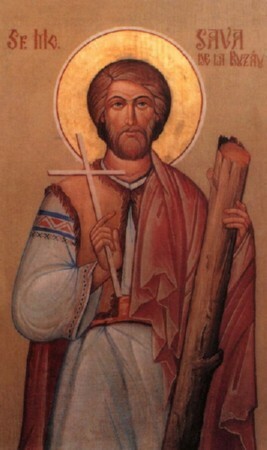 In this version, Saint Sabbas was burned on the roof of a house, during the persecution of Athanaric, the chief the Goths and he was not drowned in the river Buzău, as shows his Martyrical Act. Bibliotheca graeca hagiographica mentions St. Sabbas the Goth on April 12, 15 and 17. 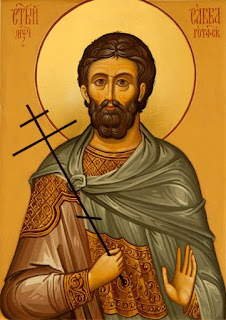 The Greek synaxaries from the Minologion (The liturgical book consisting in the daily services) celebrate St. Sabbas on April 18, and this date appears also in the Romanian Minologion, while the Slavic Churches celebrate him on April 15. On June 20, 1992, the Romanian Orthodox Church officially stated in the national calendar “the saints from other nations who have preached and were martyred in our country”, among which is also the Holy Martyr Sabbas from Buzău, called “the Goth”, celebrated since then on April 12. In the West, the Roman Catholic Calendar commemorates St. Sabbas on April 28. Today the Church of the right-believer Romanians spiritually celebrates and joyfully sings: Come ye, the martyr-lovers, and celebrate the yearly Feast of St. Martyr Sabbas’ struggles! Because these aroused by God’s will among us and wonderfully flourished, and he brought a rich crop to his Master, through his martyrdom. And now he is incessantly praying in the Heavens, for our souls to be saved!